Monthly updates to investors and team members ensure transparency and open communication. 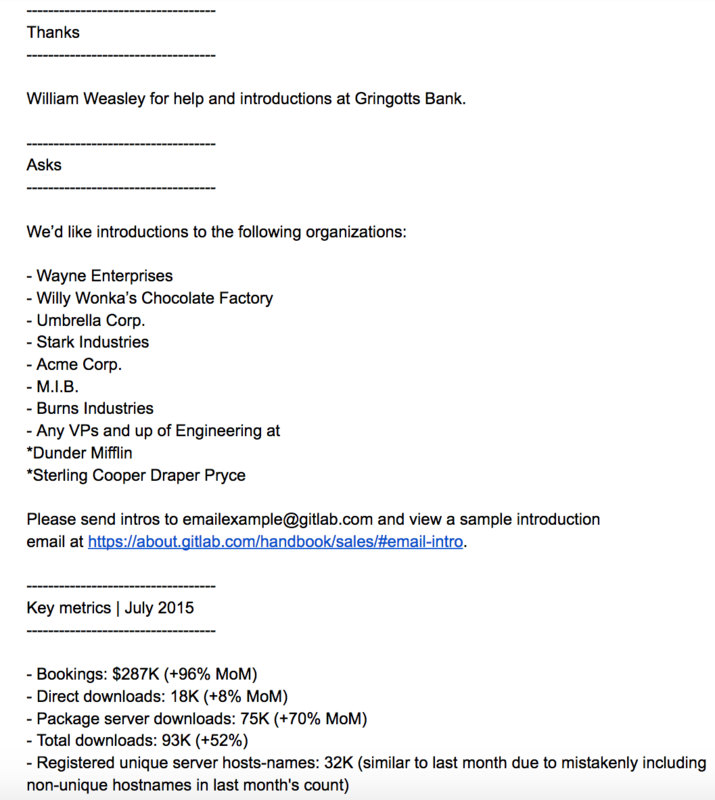 I was a bright-eyed and bushy-tailed new GitLabber of two months when I emailed Sid, the CEO of GitLab, and told him that I thought the investor update format needed a makeover. During my onboarding, I had heard that everyone can contribute, so I decided to take the idea for a test drive. I obsessively refreshed my inbox, waiting to see whether the sentiment was highly regarded only in theory, when Sid's reply arrived. Our investor update has gone through several iterations over the years. In the early days, we included sections on hiring, feedback, and upcoming features. After reading blog posts by Elad Gil and Aaron K. Harris, Sid developed our current version with their insights in mind and narrowed the scope of our update to the following sections: thanks, asks, key metrics, lowlights, highlights, and next month's expectations. 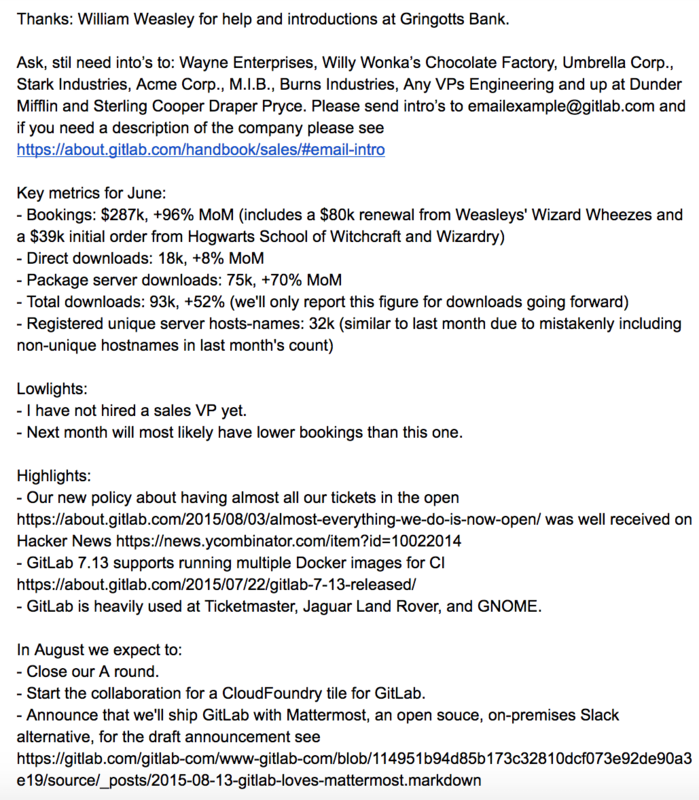 When I joined GitLab, the investor update looked cluttered, and from a reader's perspective, I had difficulty absorbing the information. Below is an example of an old update with the former template. Please note that some names have been changed to respect organizations' privacy. Knowing that investors can only dedicate a few minutes to each email, I knew that I had to organize the sections and copy in a way that would increase comprehension and reading speed, so I employed UX copy techniques. With this new format, investors can quickly read the update and locate the information that is most relevant to them. Each of the six sections provides investors with a look inside GitLab, offering a comprehensive assessment of our monthly performance. Thanks: We express gratitude for investors who have assisted us with making introductions, providing feedback, or offering assistance. Investing is a type of social engagement, and we like to celebrate people who set aside time to help us. Asks: We ask our investors to help us connect with people or organizations, introduce us to hiring candidates, or provide some other assistance. Investors can be extremely helpful and often say they want to add value when they invest, so this area of the update gives them the opportunity to drive our business forward. Key Metrics: People want to know how their investment is performing. Offering figures instills trust and shows a certain discipline and rigor. We want our investors to know how we're doing — even when we don't meet our goals — because we believe in transparency. Lowlights: Our commitment to open communication extends to this section in which we always list the top three worst things that occurred in the month. By committing to three items, the question is no longer, "Should I tell my investors?" It's "Which three things are the most severe?" That's a much easier question to answer. Highlights: This section gets people excited about the investment and illustrates what we're doing well. Expectations: We discuss what we're looking forward to, conferences we're attending, and what we're planning in the next month. If you're not sending investor updates, you're keeping your biggest proponents in the dark. If people invested in your organization, you should keep them up to date on what's happening with their investment. If investors don't receive regular communication, they're forced to go fishing for information and what they might hear could be inaccurate. Monthly updates instill confidence and save you from having to field questions from several directions. When organizations don't communicate, investors constantly have to ping their companies to ask how things are going. But, if they receive regular updates, they know they're going to hear from you and learn the most challenging things that happened in the previous month. You don't want to give your investors any reason to worry. Monthly updates also help you build stronger bonds with investors. Because the basics of an investment are covered each month, conversations with investors can focus on deeper subjects. You can brainstorm about strategy, long-term goals, and emerging trends rather than recap hiring challenges and share release updates. Investors have told us how much they love our updates, specifically expressing their appreciation of the reliability of our emails. We send the updates around the 10th (give or take 1-3 days) of every month, so investors have come to expect a little GitLab sunshine in their inbox. Investors love the format(!) and Y Combinator reached out to Sid asking whether the format could be shared with other YC founders in a resource of high quality updates. As Sid says, "The format seems to be better than average." If you'd like to send your investors a monthly update, we invite you to create a copy of our template. As you work on your update, please remember that it's important to establish a regular cadence and keep the emails concise. Links to spreadsheets with detailed figures and an offer to answer any questions prevents people from becoming overwhelmed. Our updates are also sent to team members, because we all have stock options and Sid believes that it's the company's duty to inform us of our investment. Moreover, team members should know the highlights, lowlights, and next month's expectations, since we're all working towards a common goal. We encourage you to send the updates to your team since they invest their talents, ideas, and efforts into making your organization successful.